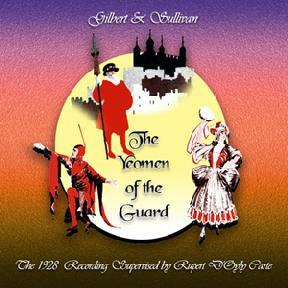 This Yeomen and the1929 Pirates, the first G&S sets to be conducted by Malcolm Sargent, were indicative of the growing realization that gramophone recordings were permanent documents and deserved to be treated to the highest possible musical values. Paradoxically, both were made when the Company was on an American tour, and therefore featured a mixture of non-D'Oyly Carte singers, singers who had retired, and others who did not make the tour. Leo Sheffield, one of the greatest exponents of the "Pooh-Bah" roles, left the Company in June, 1928. (He would return briefly about a year later.) Nellie Briercliffe, considered by many to be the greatest exponent of the "soubrette" parts, was with D'Oyly Carte from 1915-18, then again from late 1919 to early 1920, and rejoined for another eight-month stint in late 1929. Derek Oldham had numerous stints with the Company from 1919 to 1937, but luckily he was around for the two recordings made during the American tour. Winifred Lawson was with the Company nearly continuously from 1922 to 1932, but skipped the tour. Dorothy Gill played the contralto parts with the main D'Oyly Carte Company's smaller sister group, the New Company, from December 1925, to June 1927, after which the group was disbanded. She rejoined the main Company from 1931-6, after Bertha Lewis's tragic death. Arthur Hosking was with the Company from 1926 to 1928 in a variety of baritone roles, but never the Lieutenant (although he may have understudied it). Walter Glynne's D'Oyly Carte career was just a few months in 1915, but he sang chorus and a couple of small parts on many of the HMV recordings. Henry Millidge played light baritone parts from 1921 to 1926, and he apparently sang in the chorus of several recordings. His only recorded roles were the Second Yeoman and a couple lines of Sir Joseph's part in the 1922 Pinafore. Elsie Griffin, whose stint with the Company lasted from 1919 to 1927, played many of the lead soprano parts, but she always played Kate in Yeomen because she had excellent accuracy of pitch and could keep the other singers in tune in "Strange Adventure." 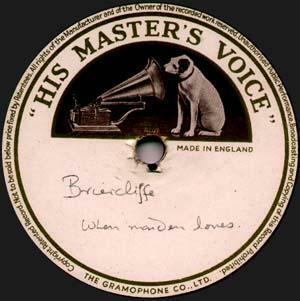 This is a scan of the label of Nellie Briercliffe's own single-sided test pressings of "When maiden loves." The matrix and take is as published. Also surviving from her collection are two sides from the 1931 Ruddigore (which see). These precious relics were at some point given by Nellie to a British vicar who contacted Michael Walters and passed them on to him, who in turn has passed them on to Chris Webster. Rounding out the cast were the ubiquitous George Baker, who never sang with the Company but nevertheless found a place on most of the 78rpm sets, and Peter Dawson, an excellent bass whose recording history dated back to the earliest complete set, the 1906 Mikado. Although a glance at the contents might lead one to believe it to be complete, it is actually cut in odd places to fit on one CD. The sound is also terrible, on the whole — worse when apparently heavily-played 78rpm sides from the copy used are treated to heavy digital doctoring. A warning needs to go out about this one. The Arabesque transfer was by the highly respected engineer Keith Hardwick. Chris Webster has licensed this tranfer directly from EMI's master tapes, and it is now available in a limited edition CD. 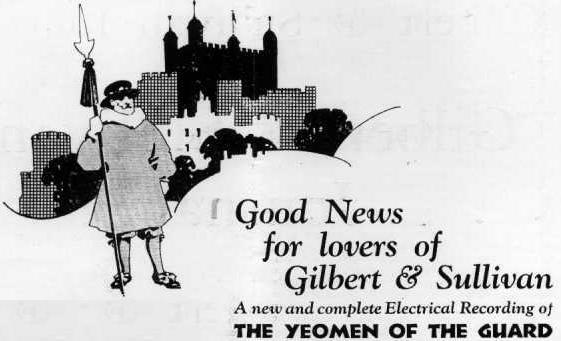 I cannot understand why the reviews of the electric recording of Yeomen fail to mention the terrible distortion of voices on many of the sides. I read somewhere I believe it was in the liner notes of that horrible ProArte CD) that a broken microphone was used during the recording. At least all of the RCA and HMV sets I have heard both in my possession and on the air have had this distortion. [Note: Throughout this piece, reviewer N. O. M. Cameron compares the recording to the earlier HMV set, recorded in 1920. Cameron's review of that set is available on another page. In preparing to record this opera, it is obvious that the company found themselves in an awkward quandary when it came to casting Jack Point. A perfect choice is hardly possible. In George Baker they give us a singer who is good both in the concert hall and in the recording room, but is unavoidably handicapped in the attempt to convey the character of the part. It would be rather absurd to complain because Jack Point on the gramophone has a better voice than any we have heard on stage, but with it we get an impression of robust heartiness that is out of keeping. From his first appearance Point was down on his luck, even before worse overtook him, and his merriment throughout was the product of effort and never spontaneous. This reservation is to be understood when any record that includes Jack Point is being considered. Derek Oldham it is hardly necessary to refer to; we know him well now and can be sure he will not fail us as Fairfax. We regret, however to find him indulging in a top note not in the score. Phoebe is also a D'Oyly Carte artist, Nellie Briercliffe, who sings her two solos with a nice light touch. 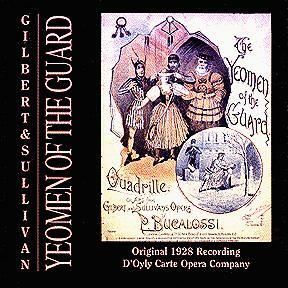 That fine song, When our gallant Norman foes is sung well enough to pass by Dorothy Gill, but her voice seems at times to be only just equal to it. Elsie's trying air, 'Tis done! I am a bride, is very well sung and with taste by Winifred Lawson. I have a song to sing, O! is a good record, but not perfect. Though I should like it taken a trifle more slowly, I do not find others agreeing with me, but at the end it should not be quickened; in support of this contention I can quote Mr. Dunhill, and it is not so marked in the score. One feels that it is the Company's duty to continue their efforts with this duet until they produce the perfect record. Most people will agree that the concerted numbers are the greatest successes of The Yeomen , and they are so, too, in recording. The two trios in the first act, Alas! I wander too and fro and How say you, maiden, which deserve better attention than they usually get, are both excellent, and the symphony at the end of the former is given this time. A man who would woo a fair maid is charming, and Strange Adventure is very good. When a wooer goes a-wooing was badly scamped in the old set; here the singers have tackled their difficult task with feeling and restraint. I am not sure that the choruses, especially the finales, are not the best things in the set. That despised little chorus, Here's a man of jollity, of which we never hear a word in the theatre, is delightful with an intriguing bit of symphony at the end. The men's chorus is sonorous, and the women are particularly good in the beautiful but difficult beginning of the finale to Act II. In the first act, the gratuitous symphony added in the old set after To thy fraternal care is now removed, and the ironic fooling is cut short by the first toll of the bell. From this point to the end of the act two full sides are allotted in place of the former inadequate one side. In the finale to the second act, Elsie's solo is now restored, and the whole, including Jack Point's intervention, is sympathetically rendered, although one might suggest, hoping it is not captious, that Elsie's regret for "the moan of the merryman, moping mum" sounds like mere lip-service, not heartfelt, also that the subsequent chorus is speeded up too much. I have said nothing yet about the orchestra, which pleases me more than anything else. Judging from results, securing Dr. Malcolm Sargent to conduct was the best thing the Company did when assembling the cast. We now look forward to a good record, in due course, of the Iolanthe overture, badly mauled in the present [acoustic] recording. Altogether a very good set, recorded with great care. Unfortunately a couple of the other reviewers for The Gramophone tended to damn Baker's G&S recordings with faint praise, generally stating that while his singing was never in question, the fact that he was not a Savoyard meant that he could not possibly have the necessary experience to interpret the Grossmith roles. Personally I find such criticism patronising in the extreme. Not only was Baker the most versatile singer ever to have recorded the patter roles, (with a repertoire that ranged from grand opera to operetta, musical comedy and both classical and popular songs of the day), but he was personally coached in the songs by J. M. Gordon himself, (Gilbert's stage manager of latter years). As an undoubted fan of the G&S operas, he would have seen the comedians of the day in performance, but, as an actor, he would have had his own interpretation of the roles instead of merely imitating what he heard on stage. Baker may not have been Lytton, but then neither was Lytton—Workman, nor Workman—Passmore, nor Passmore—Grossmith. Each brought their own individual talents to the roles and to state a preference for one above another is purely a matter of personal taste rather than any inherent 'correctness' of a particular interpretation. N. O. M. Cameron's dismissal of Baker's credentials was not universal. Reviewer Herman Klein, writing about the 1930 Patience (in which Baker recorded Bunthorne), found him better than either Grossmith or Lytton. 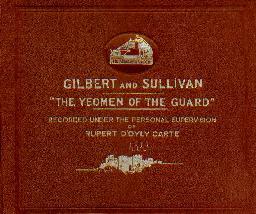 Walter Glynne sings the First Yeoman on side 10 (though Francis says it sounds like George Baker). L. Gowings sings it on side 13. Francis says that, although Henry Millidge is credited as the Second Yeomen, he is convinced that it sounds like Darrell Fancourt. Side 15 was issued on EMI's A Tribute to George Baker. The table above shows the published takes in the order recorded. Where a session produced both unpublished and published takes for the same selection, the unpublished matrix numbers are shown in italics. Where none of a selection's takes from a given session were published, the entire row is shown in italics, and the side number is blank. Where it is not possible to make a likely guess about the number of takes recorded at a session, this is indicated with … Where the published take was achieved without a make-up session being required, the unpublished takes for the same selection are not shown.